Step by step we conquered one more hill, the view was stunning. 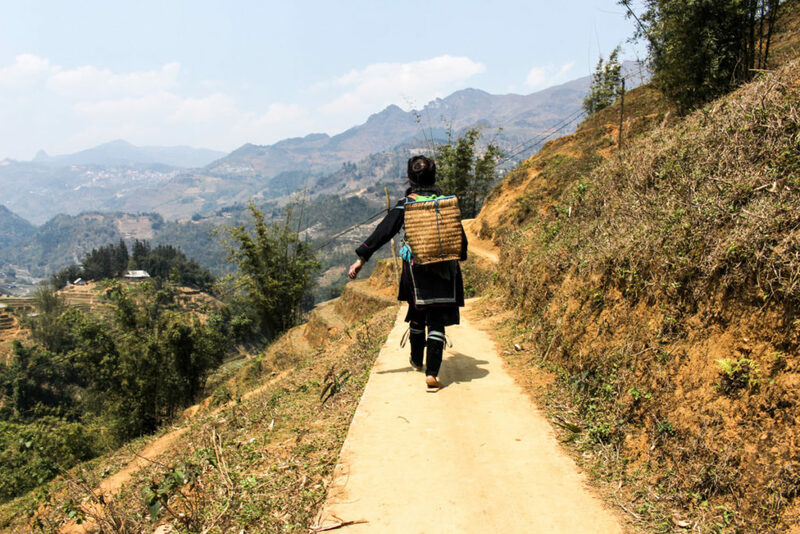 The long walk and the beauty of Sapa mountains in Vietnam took my breath away. I was tired but in ecstasy. During our 2 days trekking in Sapa mountains we passed by the ancient rice terraces, discovered tiny villages, learning about minority tribes and their way of living. A dream trip that became true! After one hour walking I understand the difference between a good and professional Sapa trekking experience and the tour/trekking tour they offer on the streets of Sapa town. We left the city behind and there was no one in our way, we had the mountains only for us. In all the villages we passed by our guide give us a lesson about history, culture and the importance of responsible tourism in Sapa. We were surrounded by nature, ducks, buffalos and rice fields. Sapa was revealing its beauty to us. We passed by kids coming from the school, people working in the fields, tribe women doing their embroidery work on the edge of those man carved hills. Rob and I are used to run, so long walks are fine for us. We started our sapa trekking tour at 9 am and we finish our first leg around midday. This was the longest walk of the tour, 9 kilometers in 3 hours. Time for our first break. We stopped in a small and simple restaurant. The wooden house had two floors, on the ground floor the cook was preparing local food, upstairs the bamboo tables with an amazing view. The food was done fast, thank God, we were starving! 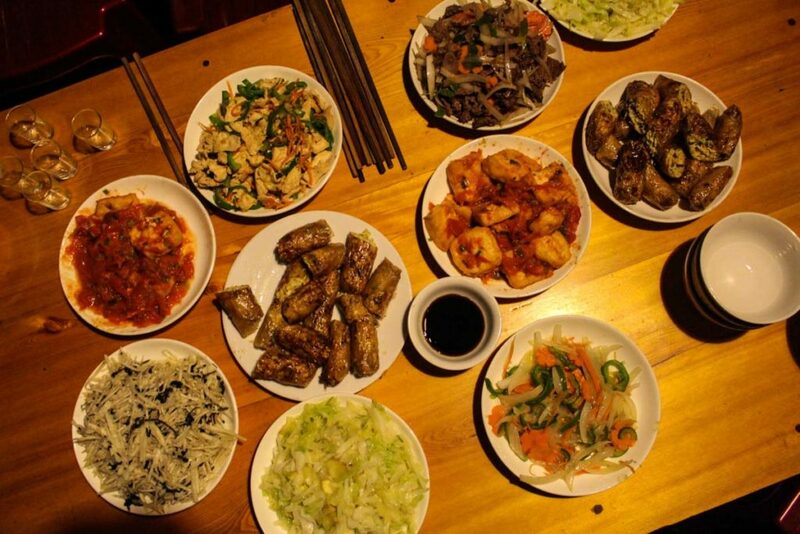 Fried chicken with vegetables, pork, fried vegetarian spring rolls, tofu, omelet, and salads. Enough food for us and for the cat that was sleeping on the bench. The food was surprisingly good. Thumbs up!! Tummy full, time to walk again. We pack our bags and hit the trail. I forgot to check the time, but I think we walked for more one hour until we arrive at a Hmong tribe village for some hands on Batik painting . Rob was too asleep to try his skills on painting, but I decided to give a try. Zi, an artisan from the Hmong tribe taught me first. She showed me how to warm the wax, to prepare the fabric and how to create beautiful free hand drawings. Her 30 years of experience made everything look so easy, but when I got the wood pen in hands I realized how difficult the work is. It´s not only painting, is creating beautiful designs using your creativity and natural materials. After drawing with wax, the fabric will be dyed in indigo for a few days, a deep blue color extract from a local plant. Later the fabric will be boiled so the wax can melt and leave the white gaps on the fabric, creating interesting and geometric designs. Everything is hand made. 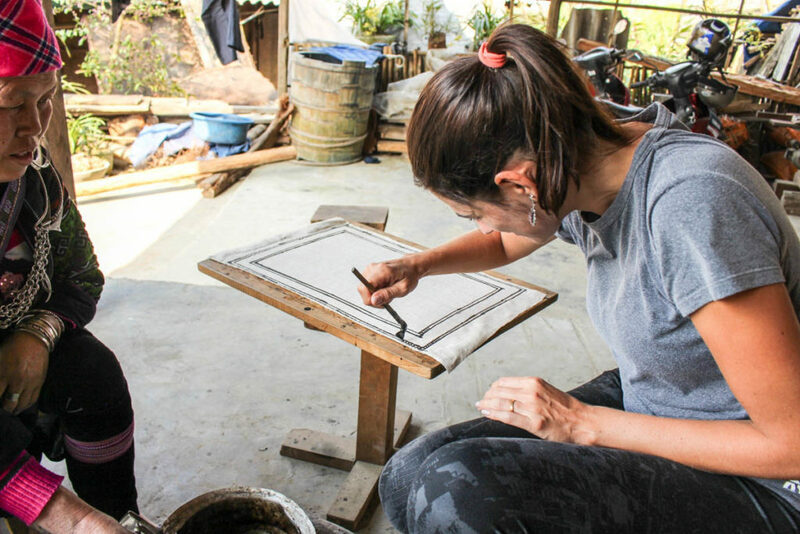 I got the chance to practice just 1 part of the Batik process. Zi explained to us that her work starts by weaving the hemp [a local type of plant, that gives long threads], creating long pieces of fabric that will be sewn into skirts, tops, blankets or tablecloth. Then comes the Batik painting, the indigo dying, the embroidery, and at the end she still has to polish the textile. So much work! A beautiful craft that has been passed by generations to generations. We learned the ancient craft and got to know more about Zi and her family. After almost 2 hours we left for the last part of our 1st-day trekking in the Sapa mountains. Time to discover more about the Hmong tribes, they way of living and how things are changing fast in Vietnam. The sun was going down when we arrived at this cute house. We were greeted by Moo, a smiley woman with three kids running around her. We reached our final destination of the day, the first part of our trekking in Sapa mountains was completed. Time to relax, think about all the beautiful places we visited, people we met and smiles we have exchanged. Moo was waiting for us with a foot bath. OMG!! That was everything I needed after a long day of trekking in Sapa. She placed our chairs facing the rice terraces, made an infusion with herbs and left us there relaxing our feet for an hour. We were interrupted only by the evening fog and the cold wind that started blowing. I was tired, by this time there were only three things I need: shower, food and bed! 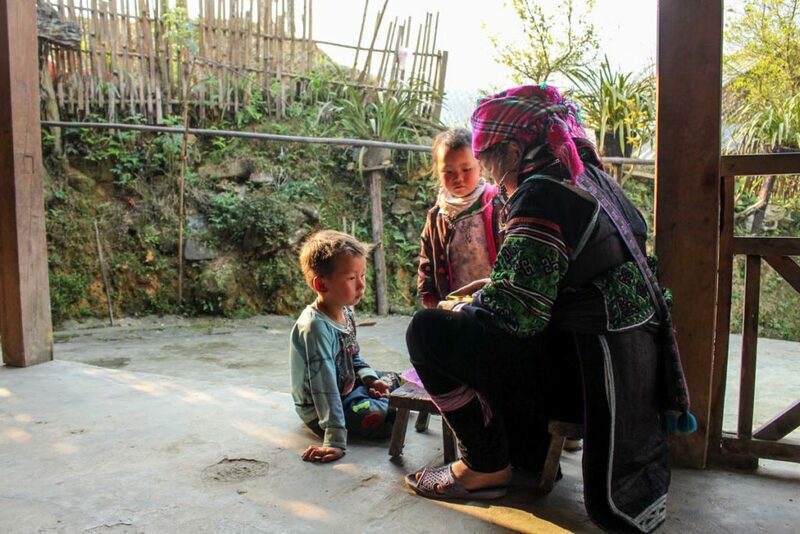 Homestay in Sapa: an unforgettable experience! I don’t have words enough to describe how unique was our experience at the Victoria Homestay in Sapa mountains. I was prepared for hard beds, mosquitos, no shower and a very simple place. The house was simple indeed, but everything was so organized, we had a huge and soft bed waiting for us, mosquito net, covers, bathroom with hot shower and amenities. Moo is an interesting woman, young, full of energy and determined. She speaks her tribal language, Vietnamese, and English, all learned by herself. Married, with 3 kids, she used to work in Sapa town selling her handicrafts and embroidery, also offering trekking tours in Sapa valley. She is an entrepreneur, a few year ago she started hosting people in her house and 2014 she signed a contract with Buffalo Tours to host travellers and share with them her culture, food and a bit of her life. Her business grew, the house became bigger, with more infrastructure, but still keep the homey feeling. She did her best to welcome us, big smile, delicious food and love. When she discovered that I’m vegetarian, she changed the dinner menu so I could have more variety of local food to taste. Rob got a special treat, Moo´s husband arrived home with buffalo meat, that he stir fried for the dinner. After the hot shower, the dinner was served. Outside the temperature dropped fast and rice wine helped us to keep warm. When dinner was over, Pa and Ze, the youngest girl and boy sat in front of the TV. Mi, the 10-year-old daughter sat under the light to practice her embroidery skills. She is getting older and she needs to learn how to weave, make clothes and cook. Hmong women need to master those skills so they can have a good marriage. She needs to learn fast, soon a boy from the tribe will kidnap her and take to his house, and her future mother in law will check how good she is, her abilities and if she will be a good wife. Moo passed by this when she was 16, and now she is preparing her daughter for the same future. This moment I realized that doesn´t matter where you are in the world, or what culture you come from parents will be always worried about their kid and women still live under a social pressure. That’s the reality in Sapa mountains, same in Brazil and in many countries around the world. At 9 pm we were sleeping. We had a long day trekking in Sapa mountains, my legs were tired and we need to recharge our batteries for the next day. The last thing I remember was the cat walking over the roof and then the mobile ringing. It was 6 am! The morning weather was chilly, pancakes and hot coffee to wake us up. Mi left earlier than us, her school is far from the village, so we didn’t have the chance to say goodbye. Before we left one more photo with Moo´s family and we hit the trails again! Sapa mountains and the rice terraces are stunning during the morning, the sun rising and the fog between the hills creates a unique scenery. The second-day trekking was supposed to be faster, but the trails were quite difficult. We got muddy paths, ups and downs, steep hills and a waterfall. The landscape changed a lot, from rice fields with water buffalos to a bamboo forest, and river crossing. How to choose the best trekking tour in Sapa? Our recommendations and Sapa travel tips! 1º Recommendation: be aware of what you choose and check if you are helping and supporting the local community. I know, this talk about responsible tourism can be boring, and many travellers don’t care about it. However, the tourism in Sapa valley is growing fast, and unfortunately not in a very organized way. So do your share and help to preserve the town, the tribes lifestyle, and nature. 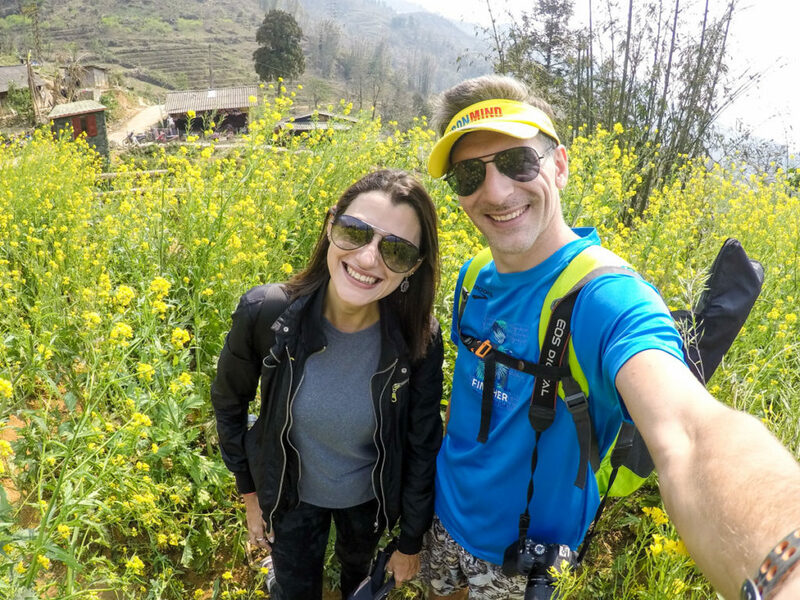 We did the Sapa trekking experience with Buffalo Tour, a company that operates local tours in Vietnam and in many other countries in Southeast Asia [like the trekking in Chiang Mai, Thailand we did and was awesome]. Why we choose them? Because we knew the trekking in Sapa would be well organized, private, and that we would be helping the community by staying in a homestay and eating in family restaurants. What make this 2 days trekking in Sapa mountains so special? Nature is gorgeous and the people welcoming. Most of the trekking route was empty, no tourists, only us and local people. 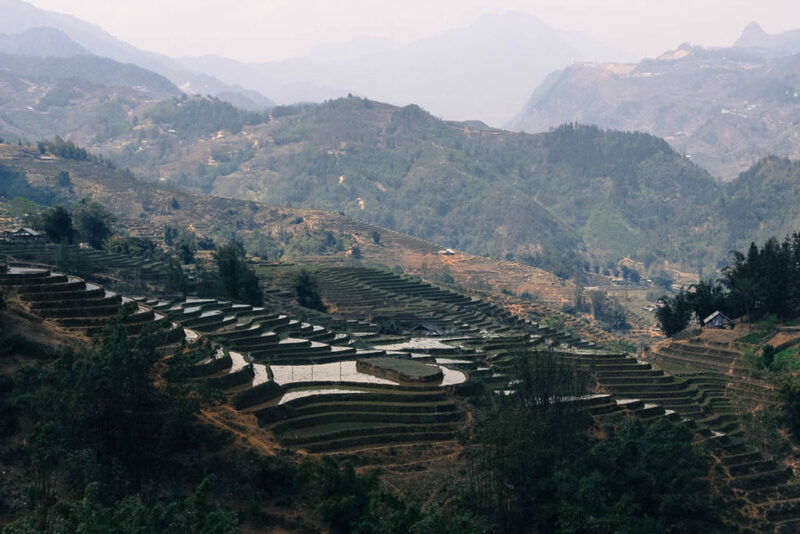 We had the chance to see and experience Sapa on our pace. The guide is a local guy, he speaks the tribe’s language and knows their history. 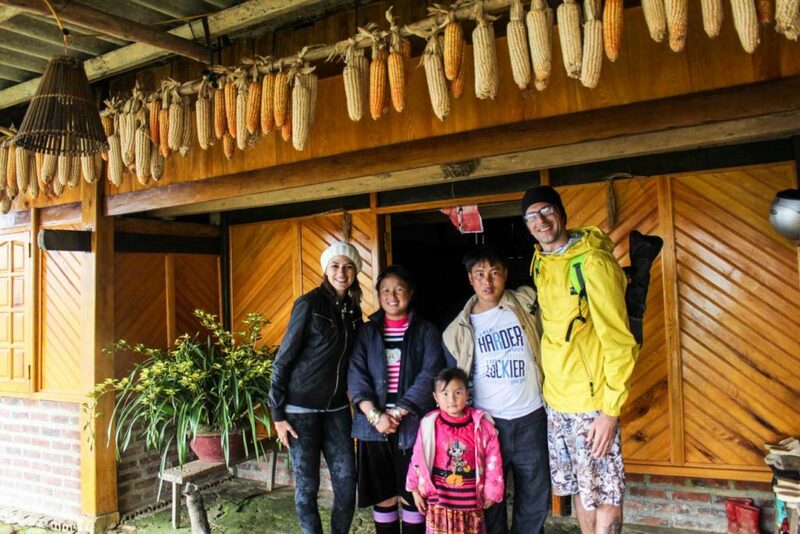 He took us to interesting places that wasn’t on the Sapa tour itinerary, like visiting the house of a shaman that leads one of the tribe community. » When is the best time to visit Sapa mountains and the rice terraces? There is no best time to travel to Sapa mountains, it all depends on what do you want to see. We were there by the end of March, the rice terraces were being filled with water, warm weather and sunny days. If you want to see the terraces full of water and people working on them the best time to travel to Sapa is April and May, the flowers will be blooming and the weather is pleasant. For green rice fields, June is the best time to trekking in Sapa mountains, but be prepared for rain and hot weather. July and August are not so wet but still hot. September is the best time to see the Sapa Mountains changing colours, on the terraces you can spot all shades of green, yellow and golden. The weather is nice, but town and mountains get packed, this is high season in Sapa. December to January is winter with heavy snow. Nature and mountains are beautiful, but it’s hard to enjoy the outdoors. » How many days to visit Sapa Mountains in Vietnam? It’s hard to say how many days you need to visit Sapa, it all the depends on what you want to do and how many days you want to spend trekking in Sapa Mountains. To be honest, apart from the trekking experience there aren’t much more things to do in Sapa. The hotels and food are overpriced [comparing to other touristic cities in Vietnam], in town people are very pushy trying to sell you all kind of stuff and tours. Unless you are a trekking lover and plan to explore the mountains during several days, I would say that two or three days in Sapa are enough. If we go back to Vietnam, I would plan my trip to Sapa in a different way. I would spend more money in a nice and more comfortable train trip, book the 2 or 3 days trekking tour with Buffalo, ask them to pick me up early in the morning at the train station, and after the tour I would catch the train from Sapa to Hanoi. I rather spend more on the transportation and on an outstanding tour, than staying in Sapa town itself. 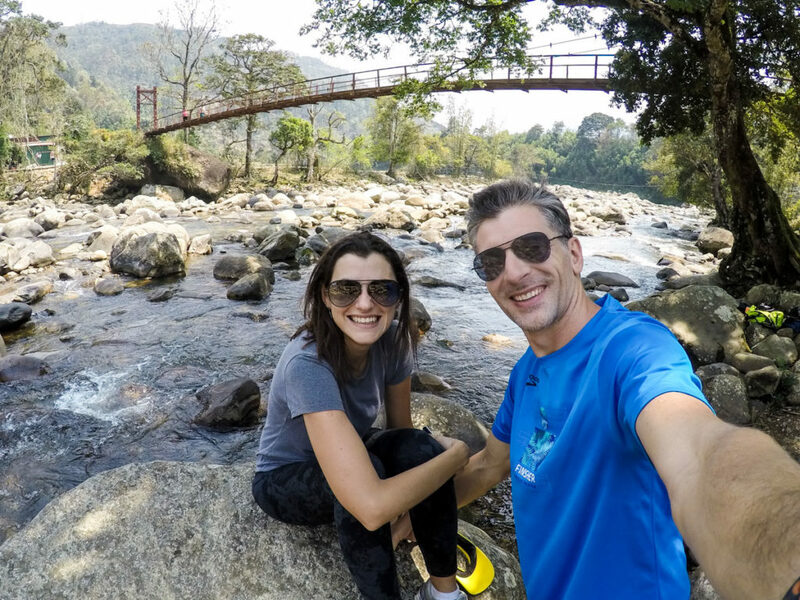 » How to get from Hanoi to Sapa mountains? You can get to Spa Mountains by bus/car/motorbike or by train. There is a new highway that connects Hanoi to Sapa, so in 3 hours you reach Sapa by car [a bit longer by bus or motorbike]. I don’t recommend you to go to Sapa by bus, you might not be able to sleep or rest during the trip. The drivers are crazy and they honk the horn all the time, every minute, and a three hours ride can become a noisy nightmare. Believe me, I have traveled in Vietnam by bus and it’s not pleasant! We choose to go by train from Hanoi to Sapa and no regrets. It was a night train with comfy beds [for Asian standards] and a fair price. We paid 335 thousand Dongs per person in a shared cabin for 4, with air con and clean bed sheet. The trip itself was ok, the train didn’t shake too much and we slept well. You can check the timetable of the trains from Hanoi to Sapa on the official website. » Where to stay in Sapa Mountains? Homestay or Hotel? There are many hostels and hotels in Sapa. The city itself is a big construction site, with hotels popping up in every corner. We choose a small guesthouse called Aseana and we don’t recommend it! The room was spacious but too dirty and with a bed harder than a rock. We slept there only one night, and it was horrible. The best websites to book a hotel in Sapa are Agoda and Booking.com. They have many options of accommodation in Sapa and you can choose by your budget, type of room or best reviews. You can also sleep at some ethnic minorities villages like we did during our Sapa trekking tour. Love it?! Share it!! Pin it for later!! Now you know everything about trekking in Sapa mountains. The unique experience you can have in a homestay, how to choose the best trekking tour and how to get to Sapa. Hope we have inspired you to travel to this beautiful part of Vietnam. If your Vietnam travel itinerary includes Ho Chi Minh City, have a look in the post we wrote about the top things to do in Saigon. We also visited the picturesque Hoi An, where we did a Vespa Tour, plus some incredible days exploring the attractions in Hanoi and some local experiences. Looking for tourist visa information? We have you covered with a guide on how to apply online for the Vietnam Visa on Arrival. Don´t forget to book your hotels in Sapa through the links below, it´s a nice way to help Love and Road. Any other question about the trekking in Sapa mountains? Don´t think twice, leave a comment! Oh guys, I am reliving this! We did a Sapa trek in 2013 and it is still one of the best treks we’ve done and we are still friends with our guide and people from the trip (we had a small group). This trek is just so rich in information about culture and nature, as you’ve proven in this article! I want to go back after reading this! Sapa is definitely an intense and rich experience. I love every moment! I bet in 2013 the city of Sapa wasn’t too crowded. Now is the time to visit Sapa, more two or 3 years and it will become too touristy. Do you recommend a trekking agent in Sapa? Hi Gemma, did you do your trek with a tour group? It was a fabulous experience, tiring but amazing. Totally recommend it! The views from the top of the mountains ae amazing, hard to forget!! OMG, I’m so jealous! This was the place I didn’t have time to visit when I was in Vietnam so long ago. I regret missing it every time I see how amazing it is there, like in this post. I guess I’ll have to go back! And that foot bath! Wow! You need to go back Tracie, it’s definitely worth it! The foot bath is heaven, especially after a long day trekking! But don’t take too long, Sapa is growing fast! Sapa is very dear to me. 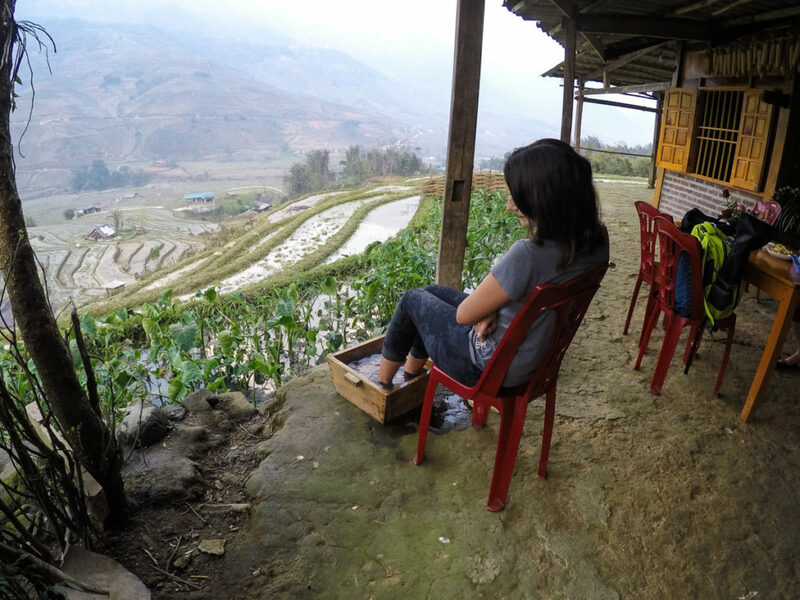 When I decided to live a life of travel, it all started in Sapa. As a Filipino, the sights were not unfamiliar to me as we also have lots of rice terraces & wild rivers. Thanks for this post—it just brought me 2 years back of what was to become day 1 of being a nomad. So glad to read your comment!! Sapa is especial indeed, two years ago, when I decided to become a nomad it was on the top of on my travel list and finally, a crossed it off! What an amazing experience! Tomorrow and heading to your country for the second, super excited. The Philippines is one of my favorite places in the world! The footbath with a fantastic mountain view is soooo inviting. I will save this post for later reading as im planning to visit Hanoi sometime later this year. Thanks for sharing! The footbath was perfect, all we needed after a long day trekking! Soon we’ll post an article about Hanoi and our local suggestions, stay tuned! Wow! This trek sounds amazing, love the idea of learning about the local crafts and the foods looks amazing. I would love to do this trip. I think it’s going on the bucket list!!! It should go to your bucket list, for sure! Sapa was for a long time a dream trip, and finally I did it. And it was amazing as I expected! This looks like an amazing trek. I love that you did a homestay. I feel like this is one of the best ways to get to connect with a culture and see how the locals live. Thanks for sharing this great post. I really enjoyed reading it. The whole trekking experience was organized with Buffalo tour that I mentioned on the post. It was an awesome private tour and I’m sure I couldn’t do the same if I planned it on my own. Totally recommend those guys! What an amazing experience! We didn’t have time to get to Sapa on our Vietnam tour and it looks like we really missed out. All that beautiful scenery, friendly people and what looks like an awesome home-cooked meals – just incredible. And how considerate to have a foot spa waiting for you – certainly deserved after a long day’s hike! Hey Vicki, now you have a good reason to go back to Vietnam! Sapa is waiting for you!! And if you go make sure to stay at Moo’s homestay, her footbath and hospitality were amazing! The Catcat village was amazing. I did that last year with a local guide who spoke good English. See my post on Facebook. There are sleeper buses (cots) from Hanoi to Sapa, and they also run during the day. The bunk-beds are single-level only. Buses stop a few times for pit-stops/refuelling. Tks for the tips Tom! We are planning a trip for March 2017. We are “walkers” but not hikers….fit for our 6th decade! Is there any way to stretch the tour to 3 days so it’s not too strenuous….or perhaps shorten the hiking but still do the home stay? So looking forward to VN!! Buffalo Tours offer tailor made tours so I believe they can organize it. Hi Natalie, my name is Gabriel and I am a part of a team that recently launched a brand new blogging community called Blogfort. And now we’re on a hunt for bloggers with exceptional blogs like yours. I have been a blogger myself for quite some time but I’ve been frustrated trying to find the ideal blogging community where I could meet fellow bloggers with whom i share common interests and perhaps common topics but to no avail, so that’s when i’ve decided to take matters into my own hands and make it happen myself. I hope you don’t take this as a spammy comment, i found your blog on facebook group and i figured rather than leave a comment i would actually see your blog in person and extend you a genuine invitation.i would love to see your posts in my blogfort news feed. Hope to see you there and everyone else for that matter. If this is not ok you can delete this comment. Hope you are having a great day, Gabriel. Tks for the invitation. At the moment we are quite busy with other projects. No time to jump on a new one. A trekking in Sapa is a once in a lifetime experience! It’s tiring but totally worth it!! As you said an experience of a lifetime! Ahhhh good memories, I went to Sapa just recently in May! I got really sick on the train ride there so I spent a day in bed, but the nest day I got myself up to do a day trek and boy was it worth it. It’s such a nice break from the hustle and bustle of the mega cities of South East Asia, also temperature wise it is amazing break from the heat. Sapa is a natural heaven in Vietnam, great to recharge the batteries and meet lovely people.. Sad to hear that you got sick. Great info! My husband and I are currently researching travel to Vietnam around october/november. I was curious about what you packed and how much. 🙂 We are planning on traveling all of Vietnam north to south. Also, taking pictures. Did you just use a phone or take a real camera? October and November the weather is nice, in the North of Vietnam is a bit cold, so I suggest to take with you a jacket and some warm clothes, specially if you go to Sapa for trekking. At night time the temperature can drop a lot there. South of Vietnam it will be warm. 🙂 For our trip in Vietnam [roughfully a month] we had only one carry-on backpack each. It’s very easy and cheap to wash clothes on the go, so you don’t need to carry much stuff. About the cameras, we have our phones, DSRL and GoPro. You can check all our photography gear on this page > Travel Resources and What We Use! We did the route Hanoi > Sapa > Hanoi only. It likes a nice story. 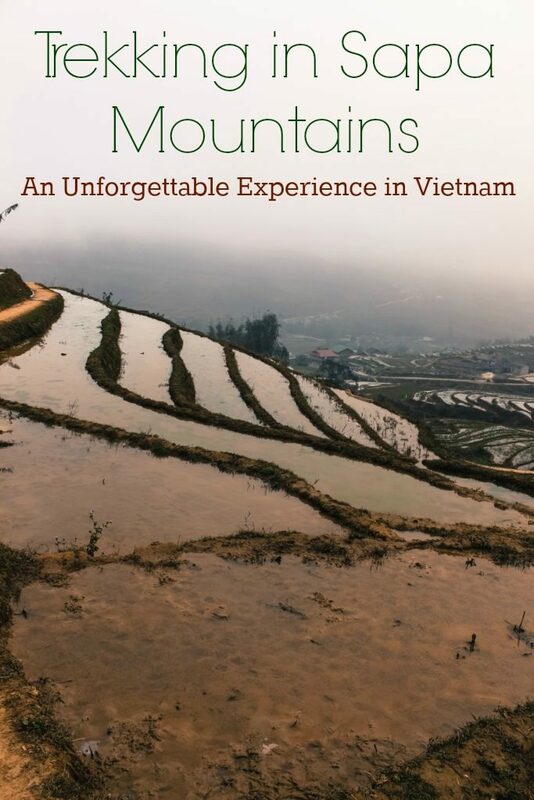 Beside with tip and Information, it helps reader understand about the beauty of Sapa. I also impress with your remark about the responsibly for local people and tourism. Thanks for your sharing. Your love inspire people alot. Thanks for the lovely words Vivian!! This was an amazing blog, I absolutely never leave comments but after reading this I felt like I had to! Very well written. I’m leaving in 20 days for my backpacking adventure in south-east Asia so this really helped with the planning! I had one question, how much would you say the tour with the homestay cost you on the first day? Tks for the kind words! I really don’t remember the rates… but get in touch with Buffalo Tours, they tend to reply really fast. Victoria Homestay in Sapa mountains? We booked our tour with Buffalo Tours. Great blog – lots of good advises! Can you tell me please what was the cost for the homestay at Sapa? Get in touch with Buffalo Tours, they organized the trekking + homestay. Nice stuff to read. Thank you.